Old postcards can be a great source of Woolworths images, and I’ve regularly used them to illustrate my Woolies-related blogs – such as my post last month about the former Ledbury store. More often than not, the subject of the postcard is clearly stated on either the picture or the reverse side, avoiding the need to work out where on earth the image is of. I was therefore curious to spot the above postcard on eBay. 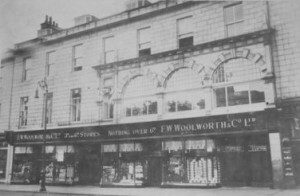 The unposted card features a fine photograph of an original Woolworths frontage, but has nothing to identify either the store’s location or the date of the photograph. Looking at the building and the feel of the photograph, my suspicion is that the image dates from the 1910s or 20s. The property is clearly not a purpose-built Woolworths – unlike many of the stores from the late 1920s onwards – and the fascia features the ‘Nothing over 6d’ message, which was a familiar sight on the chain’s earliest stores. However, the building isn’t one that I recognise from any of the Woolies photographs that I’ve previously seen on postcards, online, or in books. So, can any readers out there help to identify the location of this shop? Those curved windows on the first floor are pretty distinctive, but there’s a strong chance that Woolworths would have redeveloped the property at a later date, meaning that it won’t exist today. Whether you have a definite answer or just a hunch, do feel free to post a comment below! Well, that didn’t take long! In the space of less than two hours, S W Shopfittings (@SWSF1) on Twitter was able to identify the mysterious Woolworths as the Aberdeen store (#228), as proven by this 1970s shot at 100thBirthday.co.uk. The store opened in July 1926 – so towards the end of the period that I suggested – and occupied its site at 111-119 Union Street until its closure on 1 June 1990. Remarkably, the building HAS survived to this day, and – if Google Streetview is to be believed – currently houses a branch of McDonald’s. Interestingly, the store wasn’t Aberdeen’s original Woolworths – that was store #79, at 48-52 St Nicholas Street, which appears to have opened on 18 October 1919 and closed sometime before the early 1980s. That address seems not to exist today, though the current Gap store in St Nicholas Street bears a remarkable resemblance (perhaps coincidentally) to the flagship Woolworths in London’s Oxford Street (#161). Aberdeen city centre’s final Woolworths – #1159 – apparently opened on 9 June 1990, replacing the just-closed Union Street shop with a smaller store in the then-new Bon Accord shopping centre. That store lasted until Woolworths’ demise in 2008-09, and is now, I understand, occupied by Top Shop. There was another Woolworths in Aberdeen at the Mastrick Shopping center in one of the city’s post war housing schemes. McDonald’s occupies the bits under the arch only, to the left there is a Shoe Zone shoe shop and a vacant unit formerly Phones 4 U. The Bon Accord centre store closed a couple of days after Christmas IN 2008 due to running out of stock. There was another Woolworths store in Aberdeen located in the Mastrick area which closed in January 2009. It was Bernard Youens who played Stan Ogden that opened the refurbished Union Street store circa 1973-1975. Store was relocated in the early 90’s to the new Bon Accord Centre which was built following the demolition of parts of George Street a=had been demolished to make way for – part of the demolition included the St Nicholas Woolworths or Little Woolies as it was known locally. I recall Peter Adamson (Len Fairclough) of Corrie fame opening a refurbished Woolies in Union Street Aberdeen mid 70s. Soult's Retail View » A Woolworths staff photo from 1938 – but can you identify the location?